With a job that requires long hours, a necessary stop by the gym after work, and the chaos of NOVA/DC traffic, I very often get home too late in the evening to make something time-consuming for dinner. My solution? I save the multistep, multicomponent recipes that I love for those beloved weekends/days off and focus on quick dishes that I can throw together in a few minutes/prep ahead of time for those many, many days in between. These peppers are the perfect example of a dinner that can be partly made ahead of time, saving valuable minutes on those days when you walk in the front door late...and starving. By simply making the stuffing and boiling the peppers ahead of time, you can put the rest of the dish together in about 30 minutes. Ahhh perfect. While most stuffed pepper recipes call for ground beef (or a combination of meats) and tomato sauce or ketchup, the good folks at Cook's Illustrated decided to lighten things up a little by using simply black beans, corn, and diced tomatoes as the key components. They stood by the usual commitment to white rice, but I took it a step further and broke with tradition by using healthier brown rice. Rebel, indeed. In a large pot, bring the broth or water to a boil. Add the rice, cover the pot, and decrease the heat to low. Simmer until the liquid is fully absorbed, 20-25 minutes. Boil 4 quarts of water in a large pot or Dutch oven. Add 1 tbsp of salt and all of the peppers, making sure that the pepper are fully submerged. Cook for 3 minutes. Remove the peppers from the water and drain in a colander. Stand them up on a paper towel-lined plate to absorb any additional water. Meanwhile, add the oil to a large skillet and heat over medium heat until shimmering. Add the onion and jalapeno and saute until translucent and soft, 5-8 minutes. Add the garlic and saute until fragrant, 30-60 seconds. Add the black beans, tomato, and corn and cook for 2 minutes. Transfer to a large bowl and add the rice, cheese, and cilantro. Season with salt and pepper and stir until fully mixed. 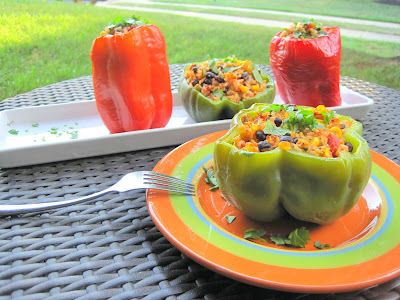 Evenly distribute the filling among the peppers and place in a baking dish. Cover and refrigerate for future use or bake immediately for 25-30 minutes.